Well, today we go back to the company that invented smartphones, Motorola and have a look at its supposed Nexus phone. Rendered by Ramon Rivas, the Motorola Nexus X is pictured below and it looks hot. Also, it lines up with the leaks regarding its features and looks. 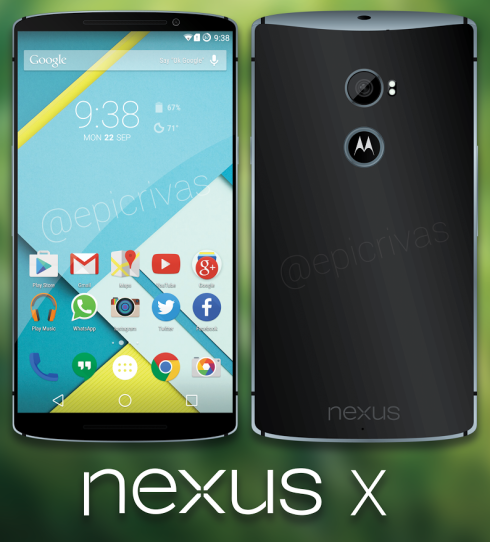 As you can see, the handset runs Android L and features a design influenced by the Moto X and the Nexus 5. There are front facing speakers, a dual flash at the back and the trademark Motorola dimple at the back. The upper and lower area are rounded, in typical Nexus fashion and the side bezels are very narrow. I have to remind you that the Nexus X is codenamed Shamu and it’s expected to be a bit of a phablet, with a Quad HD display, quad core Snapdragon 805 CPU and 3 GB of RAM. It’s said to have 32 GB of storage, a 13 megapixel back camera, a 2 MP front cam and a 3200 mAh battery. The screen will offer a 5.92 inch diagonal apparently and there’s a rumor saying we may also see a smaller Nexus X, with a 5.2 inch screen. We’ll get an aluminum bezel and what seems to be a polycarbonate back. This handset is very hot looking, it’s wide and it looks comfy, considering its diagonal.